Getting older involves a lot of life and bodily changes — both negative and positive. However, you can still enjoy the aging process as long as you understand what is going on with your body and take the necessary steps to maintain your health. Life and bodily changes are a natural part of aging, but they do not have to slow you down significantly. There’s a lot that you can do to keep yourself as healthy as possible. The beginning of the new year is the perfect time to start making healthy changes. Practicing healthy habits throughout your life is ideal, but it is never too late to reap the benefits of taking care of yourself as you get older. It’s time to ditch the junk food and start eating a healthy, well-balanced diet. Start looking for foods that are close to its natural state and nutrient-dense! Eat more WHOLE foods like: fresh and frozen produce (whole vegetables and fruit); seafood and meats; poultry and eggs; dairy, good-for-you fats like avocado, nuts and seeds; and, if it works for you–some whole grains, tubers and legumes (e.g. oatmeal, whole-wheat bread, brown rice, sweet potato and beans). Eat less PROCESSED foods like: fast-food and takeaway meals; sugary beverages and desserts; as well as foods with shortening, hydrogenated oils and/or trans fats. Choose whole-grain over refined options whenever possible to pull back on the all white breads, rice and pasta. Eating healthier meals can be easier when you plan ahead. Make yourself a grocery list before you go to the store instead of waiting until you get there and making impulse purchases. Meal prep so you don’t have to worry about cooking every night. Also make sure that you eat breakfast daily, do not skip meals and drink plenty of water throughout the day. Physical activity is good for your health at any age. 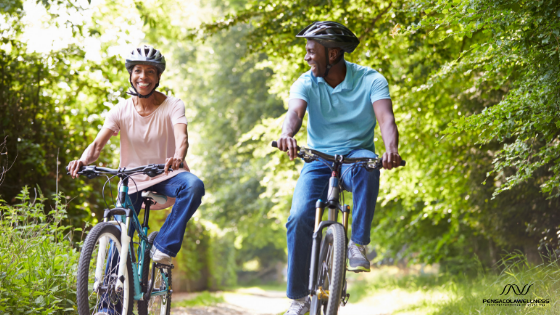 If you’ve never been active, starting a regular physical activity routine now can help improve your endurance, strength, balance and flexibility. Additionally, being active< can help you stay healthy and you will be able to enjoy life for longer. There are four types of physical activity that you should do as you age: aerobics, strength training, stability training and flexibility exercises. Aerobics: this type of endurance exercises uses your large muscle groups (chest, legs and back) to increase your heart rate and breathing. When doing an aerobic exercise, it should be easy to speak a few words at a time but not be able to have a long conversation while exercising. Two hours a week of aerobic exercise (at least 10 minutes at a time) will be very beneficial to your health and help you stay active as you age. Aerobic exercises include: brisk walking, housework or gardening, water aerobics, tennis class, kickboxing, hiking, biking or indoor spinning. Strength Training: this type of activity strengthens your muscles by making you push or pull against something — gravity, hand-held weights or resistance bands. Strength training two days a week will help increase your strength and independence and will even improve your balance at the same time. Stability Training: this type of balance activity requires you to keep control of your body as you move. It may also help strengthen muscles in your abdomen, lower back, hips and legs. Improving your balance will help you stay steady on your feet, reduce the risk of a fall or injury and improve your strength at the same time. Try to aim for stability training at least three days per week. Balance exercises include: standing up from a chair and sitting down again without using your hands, standing on one foot, walking heel to toe in a straight line, high planks while extending one arm at a time, shifting your weight from one foot to the other, leg swings, Tai Chi. Flexibility Exercises: this type of physical activity will increase your flexibility to help improve your range of motion, lower your stress and prevent stiffness as you age. Aim for at least three days per week for 5-10 minutes at a time of flexibility exercises. For all four exercise categories, be sure to take the time to warm up and cool down, wear a sturdy, supportive pair of shoes and drink water before, during and after. Be sure to start slowly and build up to more intense activity and stop if you have any pain, become dizzy or feel short of breath. As you age, your needs for vitamins and minerals change. Also, changes in your body can make it harder to absorb nutrients from food and diet alone. Along with a nutritious diet, taking daily vitamins and minerals can play an active role in supporting your overall health and wellbeing. Start with a multivitamin that includes vitamins A, C, E, D, selenium, B vitamins, potassium, omega-3s and probiotics. Getting older doesn’t mean you have to be tired all the time. Getting a good night’s sleep will help you stay healthy and alert. All adults need between seven and nine hours of sleep each night. If you’re struggling with getting a good night’s sleep, here are a few things you can try: follow a regular sleep schedule, avoid napping in the late afternoon or evening, develop a bedtime routine, use low lighting in the evenings, avoid eating large meals close to bedtime, exercise regularly each day but not within three hours of your bedtime, try not to watch television or use your computer or phone in your bedroom and stay away from caffeine late in the day. Don’t neglect yourself. Regular check-ups with your doctor, dentist, optometrist, endocrinologist, etc. is even more important now than ever! Stop putting it off and make your appointment today! Healthy eating, regular physical activity and taking care of your physical self are the keys to good health at every age. Additionally, they may lower your risk for obesity, heart disease, certain cancers and type 2 diabetes. They may even help you maintain orthopedic health and ward off depression. Taking care of your physical self is vital to healthy aging, but it is also important that you tend to your emotional health as well. Reap the rewards of your long life and enjoy each and every single day!